Kate and Garrett got married a couple weeks ago. The skies were smokey, and we were just coming down off the heat wave that swept the puget sound area. That didn’t put any dampers on their celebration, though. 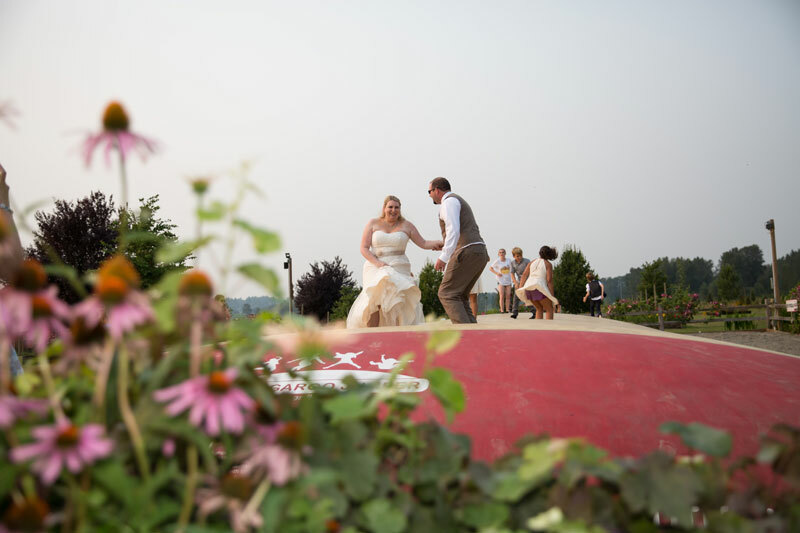 Their processional included a real ball and chain gag, the groom and groomsmen all wore crazy socks, and the bride and groom even got up on the farm’s jumping pillow for a few minutes during the reception. Laughs were intermixed with happy tears. The gorgeously landscaped grounds of the farm made the perfect setting as they celebrated with their friends and family, some how had flown in from the UK to join them. The smoke even made for a wonderfully soft mid-afternoon light – something us photographers live for. The bride looked gorgeous, and I absolutely loved the dresses the bridesmaids wore. It was such a great day, and we were so happy we got a chance to capture it.